Life is Good... At the Beach: The Big Day has Arrived!! One of many photos to be taken today and tomorrow. 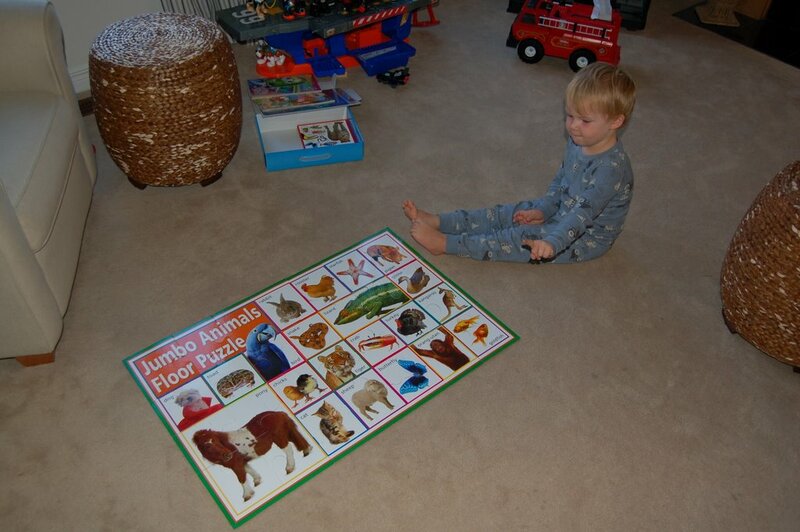 Here is the happy three year old doing his big floor puzzle. Suddenly he has become in love with puzzles. In the background you will see his new Tonka firetruck and part of his Rescue Heroes aircraft carrier, which was an early birthay gift last weekend from a garage sale. Also received from Mom and Dad was a Spiderman Mega Blocks car, Veggie Tales video, colouring books and puzzle and a box of animal cards which included the giant puzzle above. It was a great morning, reminicent of my earlier years when my Mom, Dad and Sisters would come into my room in the morning with presents. We never got out of bed on our birthday, we waited for the tell tale singing from my Dad, complete with coffee in hand. I want J to love waking up on his birthday as much as I did as a child. This year he has been so excited for his birthday we were worried it would be a bust. But, it has turned out to be a huge success. Happy Birthday Big Boy, now I really can't believe you are 3 years old!!!!!!! Oh what a wonderful way to wake up. Everyone should feel so special! Happy Birthday J! I hope it's Awesome! Happy Birthday growing up J! And I love your special traditions too.